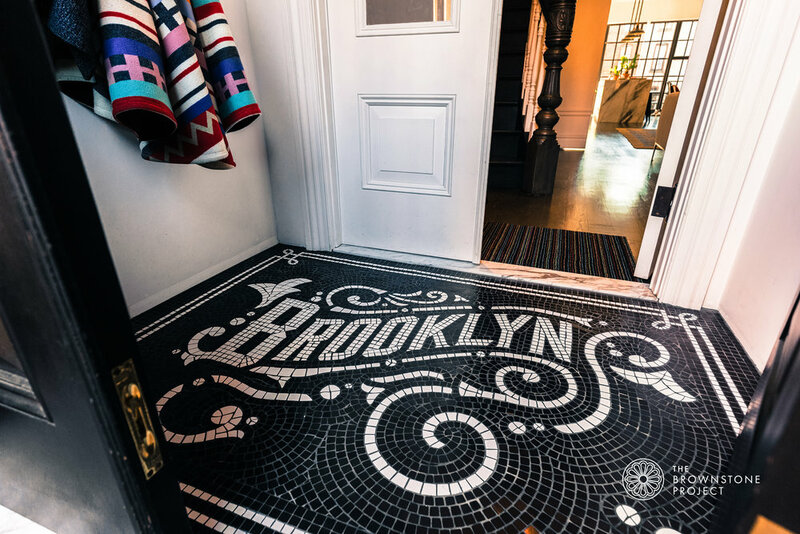 A notable feature of the classic brownstone is the entryway mosaic floor. Inviting visitors into the home with an aesthetic flourish, these mosaic-tiled vestibule floors serve both functional and decorative purposes. The art of mosaics in architecture has experienced a decline in the modern era with many practitioners having retired. The Brownstone Project is committed to reviving the art of mosaics, working with newly emerging specialists in the field. We are happy to offer custom entryway mosaic design and installation services to the discerning clients. These captivating pieces create unique, timeless enhancements to the home while deepening its historical footprint. Working with our design team you will be able to co-design a bespoke mosaic for your home, which will then be lovingly built and installed. The process takes roughly three months, end-to-end. If you would like to make a unique statement for your own home please email us at mosaics@thebrownstoneproject.co for further details and pricing. Please note, following media exposure of one of our pieces, we are experiencing a high demand for this service and are taking reservations for two months from point of contact.